Every exhibitor bringing one or more horses to the show for show horse ring events will be required to list each horse being shown together with the PIC for the property from which the horse has come on the waiver form before competing. Failure to provide a PIC will disqualify a horse from competing. All Pony Classes shall not exceed 14 hands in height. Galloway classes will be over 14 hands not exceeding 15 hands. Hack Classes will be 15hhs and over. Random measuring may be undertaken by the chief steward at his discretion. Failure to comply to the request will lead to disqualification. Any competitor found to have breached the ASC disputes and disciplinary regulations will be investigated by the ASC Disciplinary Committee. 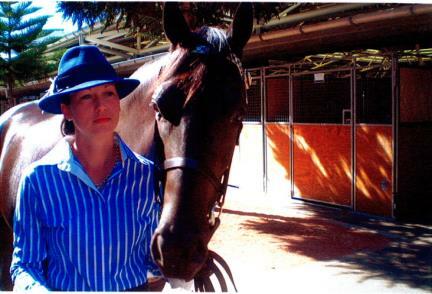 Random drug testing for horses will be conducted by ASC at six (6) shows this year. If participants are asked and they refuse, disqualification will result. 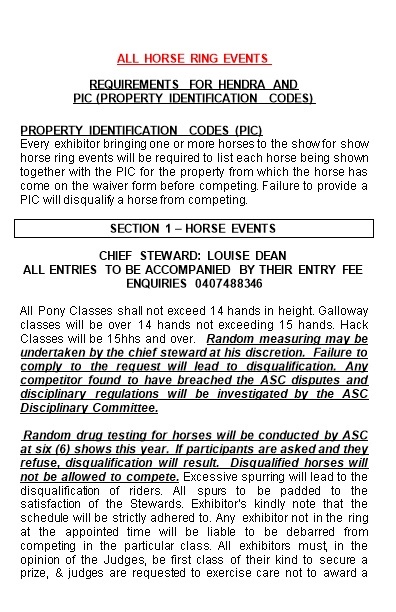 Disqualified horses will not be allowed to compete. Excessive spurring will lead to the disqualification of riders. All spurs to be padded to the satisfaction of the Stewards. Exhibitor’s kindly note that the schedule will be strictly adhered to. Any exhibitor not in the ring at the appointed time will be liable to be debarred from competing in the particular class. All exhibitors must, in the opinion of the Judges, be first class of their kind to secure a prize, & judges are requested to exercise care not to award a prize unless the exhibit is up to standard. All competitors must be properly attired. To speed up the recording of place getters you will be issued with a ticket number once you purchase your first ticket and you will have to submit details of horse, owner and riders. You will be given a number for the horse and another number for the rider. If there will be a number of riders for the same horse during the show, then each rider must have a separate number. The horse will have the same number for each rider. The forms will be available at the Post Entry Box. Horses are requested to remain in marshalling area until called. Laneway must be kept clear. If events clash, competitors may have to decide which event they wish to enter. All competitors must enter and pay for entries at the entry to the ring. Any dispute concerning this competition must be referred to the Secretary in writing, for reference to the committee. There will be an opportunity for competitors who have won ribbons to donate the ribbon back to the show. There will be a box at the entry to the rings for ribbons to be placed in, and competitors will be given a ticket for an opportunity to win a prize. There will be multiple draws during the day. A limited number of pipe stalls are available at $10.00 for the Show. All stalls to be booked through Secretary. Fees must be paid as soon as stalls are occupied. No temporary yards to be built. No dogs allowed on Showground. Camping fees are payable at the Secretary’s office or to Authorised persons before entry to Showground camping sites. This fee must be paid on arrival. $5.00 Entry fee per class. Horses must be registered and exhibitors must be current financial of the A.N.S.A. Papers to be produced upon request. LAUREN DEAN SUPREME LED AND RIDDEN ALLBREEDS TO BE JUDGED AT THE CONCLUSION OF BREED JUDGING. LAUREN DEAN SUPREME RIDER UNDER 17 YEARS (from 105203)RIBBON, RUG & GARLAND DONATED BYFamily & Friends. LAUREN DEAN SUPREME RIDDEN HACK OF SHOWRIBBON, RUG,PERPETUAL TROPHYGARLAND Donated by Family & Friends. LAUREN DEAN SUPREME CHAMPION HACK OF SHOW, RIBBON, RUG, PERPETUAL TROPHY& GARLAND DONATED BY FAMILY & FRIENDS. Horses must be registered and exhibitors must be current financial members of the A.S.P.A. Papers must be produced upon request. LAUREN DEAN SUPREME SHOW HUNTER HACK OF SHOW RIBBON, RUG, PERPETUAL TROPHY& GARLAND DONATED BY FAMILY & FRIENDS. Horses must be registered and exhibitors must be current financial members of the R.P.S.B. Papers to be produced upon request. Class 352 CHAMPION RIDDEN R.P.S.B and RES CHAMPION RIDDEN R.P.S.